In an informal experiment aimed at improving memory and attention, I stimulated various regions of my brain using tDCS therapy for 130 sessions over 135 days while simultaneously completing the working memory task dual n back. Each session lasted about 30 minutes. I found that my scores significantly improved both during “live” tDCS treatment and also during intermittent “off” stimulation memory task sessions. I had previously done the dual n back task thousands of trials over the course of two years so the improvement in performance cannot be attributed to practice effects alone. Just as some of the literature suggests, I found that tDCS can improve a very specific skill (in this case “brain game” performance), but the jury is still out as to what benefits, if any does tDCS have in improving other skills outside of training. When most people think about stimulating the brain with electricity, the reactions are knee-jerkingly negative. Electroconvulsive therapy or ETC comes to mind which is seen as a last resort treatment for the severely mentally ill. However, ETC is only the most primitive and barbaric way of stimulating the brain and is reserved for only the most serious of cases. There are better, gentler, and less invasive ways of brain stimulation. tDCS or transcranial direct current stimulation is one of those gentler options. Both ECT and tDCS both use electricity to directly change how the brain functions, but that is really where the similarities end. For one, ECT involves inducing a seizure that results in an entire body convulsion and the patient usually goes under general anesthesia; the jolt of energy in ECT is very large and negative symptoms such as memory loss are widely reported. tDCS, on the other hand, sends a tiny current to a small targeted region of the brain while the subject is fully aware and conscious. tDCS hit the mainstream spotlight when Scientific American reported that the United States army uses tDCS to help train soldiers fifty percent faster. Once I heard that tDCS can speed up learning and that the device can easily be set up at home, I decided that I have to try it. From April through August 2013, I took part in an extensive tDCS stimulation journey. I wanted to do it for many reasons such as improving attention and memory as well as to see if I would notice a global improvement processing speed. While researchers are uncertain exactly how tDCS may increase learning speed, some speculate that it may be due to a thickening of white matter in the brain. My original intention was to complete 90 days or more of continuous tDCS sessions. I ended up doing 130 sessions over 135 days and only missed 5 days of tDCS during that time. This schedule would not be possible had I not been able to do it at home. I wanted a way to measure my progress in an objective or quasi-objective way, and I chose dual back for multiple reasons including that the task has been published in peer-reviewed journals as potentially improving memory and non-verbal intelligence. I also had extensive experience with the game which well established my baseline and plateaued progress. The dual n back software program I used for the tDCS sessions was Brain Fitness Pro (Windows edition). As an alternative option, many people use the ever popular Brain Workshop. While Brain Workshop offers more exercises and customization at a better price (free), I found that Brain Workshop had a better user interface. For example in Brain Fitness Pro, the trial number starts at number 20 and counts down to 0 while Brain Workshop starts at trial 1 and increments endlessly. I believe this was one of the reasons why I was more likely to complete a full 20 to 30 minute session with BFP. It’s true that seemingly small or trivial changes in user interface can make a big difference. Just ask Google when they decided to test out over 40 shades of blue to see which button color got the most clicks. The 10-20 EEG system guided me where to place the electrodes. It is a well-established and internationally recognized way of describing electrode locations. That way a location like FP1 is universally known as the left forehead region. Especially in the beginning, when the first regions I stimulated where the hard to reach parietal lobes (P4 & P3), I used a tape measure to locate where the electrode should go. Later on, when I stimulated the frontal regions, I became more comfortable to just “eyeball” where the electrode should go. Unlike traditional electrodes which require more precision, the standard tDCS sponge electrodes are quite large so it’s easier to place them. Before each stimulation session, I soaked the electrodes in saline, and cleaned areas of my skin and hair that were to be in direct contact with an electrode. I created a saline solution by dissolving 9 grams of table salt in 1000ml of water. As soon as I placed the electrodes, I turned on the device, set the time and intensity, and immediately started playing dual n back. The tDCS device was on for about 30 minutes and I would normally finish the dual n back session a few minutes before those 30 minutes were up. During the remaining “on” time, I would read the online news or simply stare into space and observe the shift in consciousness while I wait for the device to ramp down. Rather than just randomly zap my brain in different places and then hope for the best each day, I took a structured approach. I wanted to spend enough time on each brain region so that positive, long term changes would occur – if they were to occur. In general, I decided that I should spend at least 15 days on each region. I also wanted to stimulate anterior and posterior regions using the anode. I started with the parietal regions and worked my way to the frontal poles and then finished off with the temporal lobes. 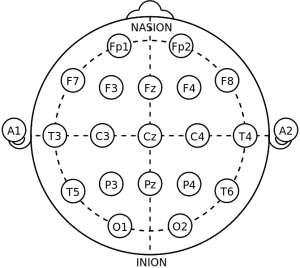 The major exception from my general pattern of stimulation is that I decided to spend 30 days on F3 and skip F4 altogether. The left dorsolateral prefrontal cortex (F3) has been associated with everything from memory to language to mood so I had additional interests of spending extra time in that area. On the flip side, F4 on the right is potentially more associated with negative behaviors such as anxiety and OCD so I figured it would be reasonable to skip it. Of course, this is all very simplistic as different things affect different people in different ways, but I needed some sort of educated guesses to guide my setup. For the entire experiment, the reference electrode (cathode) always went on my contralateral arm. I never tried a montage that involved placing the cathode on a brain region. One of the reasons is that researchers are not entirely sure where the best position is to place the reference electrode. Considering the inattentive ADD symptoms I was trying to treat, I wanted to increase, not decrease, neuron excitability, and therefore would not want to place the cathode on any brain regions unless future research suggests otherwise. The cathode size was constant at 70 x 100 mm and I experimented with the anode stating at 50 x 70mm and then used the smaller 50 x 50 mm to achieve a higher current density. Of course, the current density depends on the current strength as well as the electrode size. Once the sponge coverings that came with the tDCS kit wore out, I found that the best DIY sponge replacement is not kitchen sponges, but rather 4 x 4 inch sterile pads that are available at any drugstore. I experienced unusual burning using kitchen sponges, and tDCS sessions often ended prematurely because my device automatically shuts down when the pads are too dry. During and after tDCS, I experienced more alertness as well as what I could consider a definite perceptual shift. My field of view had greater depth and it seemed like my brain could create a better internal map of three dimensional space. My mind felt more “open” and brain fog was reduced if not eliminated altogether. One of the reasons why I was so curious about tDCS was because I wanted to see if I could identify specific results with specific brain regions. I had always known about the “left brain” verses “right brain” processing differences in a more theoretical way, but with tDCS I was able to truly “feel” the differences. Most notable, stimulating the left regions (odd EEG numbers) resulted in better objective scores, but stimulating the right regions had perceptual benefits that just could not be captured in the exercise. (If I had started with the left side first and then moved to the right, it would be interesting to see if the results would still be higher for the left.) Stimulating the right and left temporal lobes provided for a unique experience and the other regions did not, but I also experienced mild nausea that I never had during any other region. The impression I left with is that directly stimulating certain brain regions allows one to peak at brain functioning in a way that cannot be done with drugs alone. 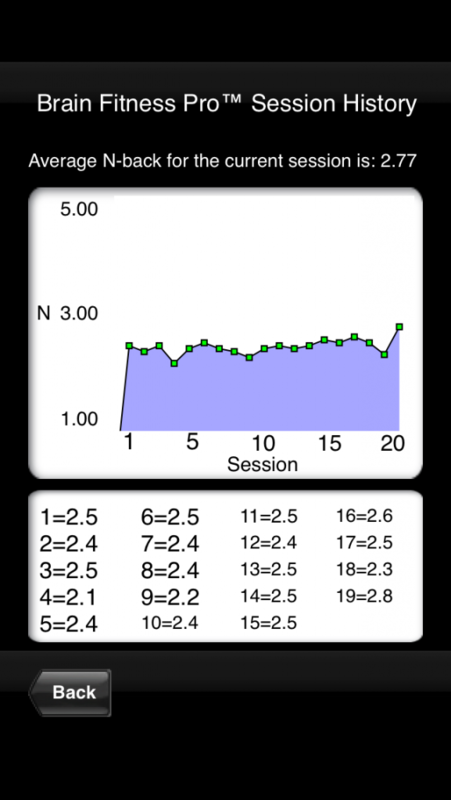 The graph starts at dual n back sessions 1 through 5 with an average session score of 3.9 pre tDCS treatment. I want to make it clear that this graph does NOT document the first time I have ever played dual n back or any time before September 2012. I have been playing the game since September 2010 on a multitude of software platforms including iPhone applications, online versions, and the Brain Workshop desktop version so it would be impossible to truly track my progress over time. I did manage to screen capture the first 20 sessions I have ever played dual n back which was on the Brain Fitness Pro iPhone app: averages ranging from 2.1 to 2.8 so I have come a long way since then. The green parts of the graph are the live tDCS stimulation scores. Roughly speaking, I stimulated the brain region indicated by a 10-20 EEG electrode placement code 15 times over 15 days before I would do a single session without live tDCS. There were some exceptions; I stimulated region F3 30 times over 30 days. The single session is at least 12 hours after the last stimulation period. This single session is indicated by a purple stripe. 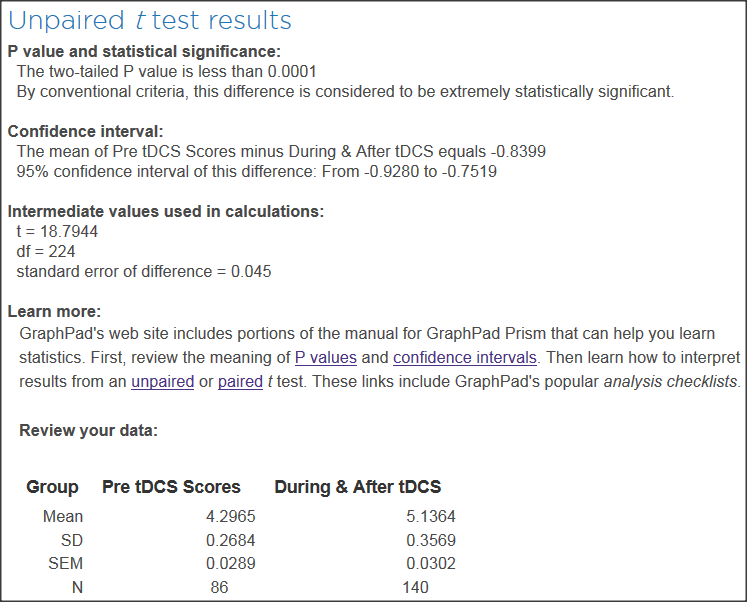 Using the T test calculator at GraphPad.com, I compared the 86 pre-tDCS average scores with the 140 scores that were competed either during or after tDCS. The resulting P value is less than .001 which is “extremely statistically significant.” Of course, statistics do not tell the whole story if practice effects were at play, but considering that I have done the dual n back task (on and off) over two years before starting the tDCS experiment, my baseline was well-established. During the trials, I kept an excel sheet (viewable here) that contains the raw scores and some notes, but it was really meant for my own personal records and thus a bit sloppy. As I noted on the Excel data sheet, I did add some general health supplements during the tDCS trial. Theoretically, correcting nutritional deficiencies can improve scores. However, do not think that they really effected the results or if any of the supplements did skew the results it would not have been until towards the end of the trial period. It was not until day 141 of the tDCS experiment that I started to experiment with supplements such as magnesium l threonate, zinc, and coQ10. When I include only the first 140 days of tDCS into the t test calculator and I compare it to the pre-tDCS data, the resulting P value remains unchanged at less than .0001. In fact, after only two weeks of tDCS, I reached statistical significance at P = .0026. Ideally, if I were to change the way I did the experiment, I would have gone longer periods of post-tDCC dual n back sessions to see if I can maintain the results. The way I did it was that after about two weeks of constant stimulation, I would do a single session 12 to 24 hours after the last time I did tDCS. The reason why there were so little scores without live tDCS was that I wanted to potentially take as much advantage of tDCS stimulation as possible since I was already aware of the effects of just doing computerized brain training by itself. It would also be beneficial if I had done additional pre and post-tests to see if the increase in dual n back scores will benefit other tasks. It also goes without saying that this was an informal, non-controlled, n=1 experiment done at my home and the imperfections associated with this setup are many. Given some of the positive effects reported from tDCS, the million dollar question is, “Should people start zapping their brains at home for cognitive enhancement?” My answer would be “not so fast.” While tDCS is a curious tool for researchers and self-proclaimed biohackers, I don’t think that tDCS is the panacea that will cure ailments or turn you into a genius. While I was more alert and experienced some mood brightening effects, results were generally temporary and tDCS alone was not enough to treat my ADD and dysthymia symptoms. tDCS may be more effective when combined with pharmaceutical therapies rather than as monotherapy. 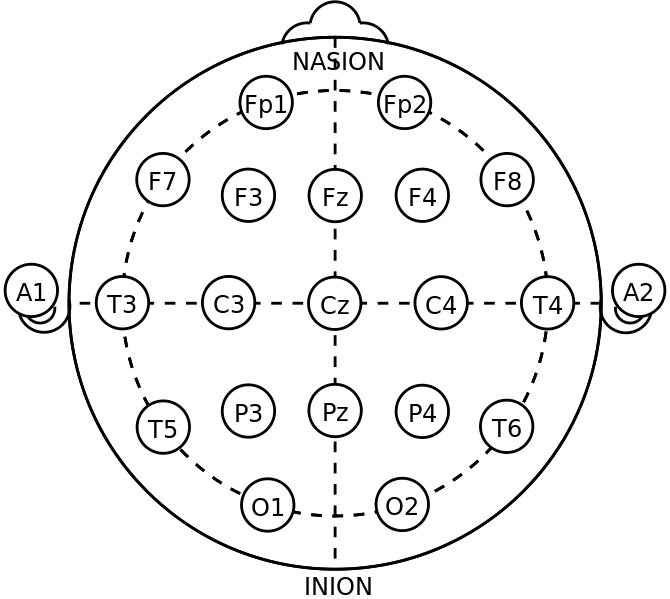 While dual back scores significantly improved using tDCS, unfortunately, getting better at a computerized brain game is not too exciting if that is the only thing you are getting good at. There have been studies that have shown that tDCS may increase a specific skill such as number processing but that such improvements are evident only for the task learned at hand. tDCS is worth looking into for possibly increasing skill acquisition outside a lab setting. The place where tDCS really shines is if it can facilitate useful skills such as playing the piano or learning to speak Spanish. Originally, I had considered using tDCS to see whether it can increase learning of a practical skill such as learning to play an instrument, but then it would be more difficult to measure progress. Dual n back scores are much easier to measure. Additionally, as The Mental Cost of Cognitive Enhancement suggests, if you are getting better at a task by using tDCS, you must also question the subtle negative effects on other tasks. At the same time, these “mental costs” are normal population fluctuations. For example, one who has exceptional verbal skills may also be physically clumsy or one who is exceptional at math may conversely have trouble with writing essays. tDCS or any method of cognitive enhancement is a calculated decision with risks and benefits.